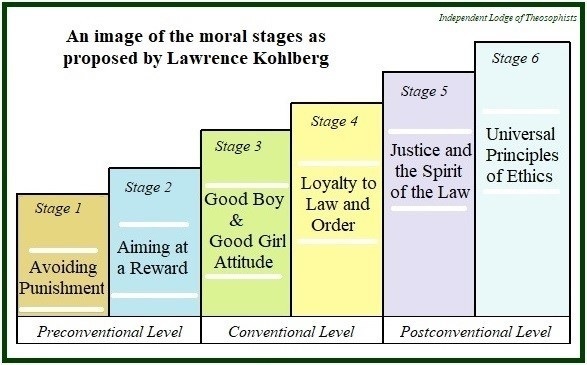 North American Psychologist Lawrence Kohlberg wrote that the moral growth of human beings has six stages, but nowadays only a small percentage of people achieve the highest stage. Taking Jean Piaget’s works as a starting point, Kohlberg defined the phases of ethics as part of the psychological development of children. In fact, the six stages are valid for people of every age, for the most different ethnicities, and the various kinds of social group in any nation. The six stages also coexist among them. Life is contradictory. Every person has various levels of reasons to act in correct ways and different definitions of what is correct. Presidents and Prime Ministers are no exception. In each individual or social group, some levels of ethical consciousness are more important than others. The lower planes are transcended when there are wide horizons and enough accumulated experience. Souls that are still childish use to ignore the higher stages of ethics. From a theosophical point of view, the stage on which an individual places himself depends on the amount of experience and degree of good sense possessed by his individual soul. Let us see then the stages of moral perception formulated by Kohlberg. 1) In the first stage – lowest and most basic – “right action is that action which is not punished”. The priority is to avoid condemnation: for this reason obedience occurs. The wrong action is the action that provokes punishment. In the absence of penalty, no wrongdoing is perceived or acknowledged. 2) In the second stage, right action is seen as that “which serves the interests of each one”. The goal is obtaining a reward. Now the exchange and the deal between individuals occur on the basis of immediate interests. Case-by-case decisions are dominant. Mutual help takes place with a short-term view of things. The two initial stages of morality are called “preconventional” because there is no code of conduct in them. Actions are seen as isolated events, and the wider context is hardly seen. 3) In the third stage, the child (or the adult) demonstrates he has a good character. It is the stage of the “good-boy attitude”. The goal is obtaining social approval or the sincere support of the elders and the more powerful persons. Now the axiom “do unto others as you would have them do unto you” is both understood and followed, even if imperfectly. The person has a sincere sense of justice and reciprocity. The feeling of compassion is understood and – up to a certain point – experienced. A conformist attitude may also occur; yet there is a true sense of ethical commitment. 4) The fourth stage is dominated by the idea of Law and Order. At this point, the practice of respect for and obedience to the leader, the boss, the teacher, as well as due regulations, plays a key role. Discharging one’s duty is the priority. One must follow the rules and obey authorities without cavil or delay. Stages three and four are called “conventional”, because in them the individual is sincerely loyal to the collective rules and norms. 5) In the fifth stage of ethical development, therefore, the individual realizes that the laws and customs are sometimes unfair. If necessary, he tries to improve them. He does that through legitimate means, in democratic, morally acceptable, ethically responsible ways. Examples of such a moral perception (as well as that of the sixth stage) are Mohandas Gandhi, Martin Luther King and Chico Mendes, the defender of Amazonian Forests. These three social leaders gave examples of altruism, and were assassinated in cold blood precisely for defending noble ideals and a higher ethics, which oppose the logic of organized ignorance. In the fifth stage, an effective social contract is sought that can be fair to all. The higher levels of moral development result from a thorough understanding of the law of nature. The Natural Law theory, as Kohlberg wrote, “holds that there are universal or natural principles of justice that should guide all societies and that are known to us by reason independent of specific religious revelation or faith”. Stages five and six are called postconventional because they go beyond appearances. They question institutionalized injustice and aim at the inner improvement of both individual and society. The son of a Jewish father, Kohlberg participated during the 1940s in the struggle to save lives of persecuted Jews in Europe, and in 1948 spent some time in Israel. Throughout his adult life Kohlberg followed the principles of fifth and sixth stages. However, his generous view of the world irritated more than one scholar and created difficult situations for him in academic circles. He was also admired by many. 6) In the sixth stage of moral development, the individual – or the community – tries to live according to the principles of universal ethics. Today the human beings who live in this stage are not numerous. They are forerunners and prepare the future. They pave the way for a lasting improvement in human evolution. To heal the world and change it for the better – “Tikun Olam”, in the terms of the Jewish tradition – is the goal. Here one’s consciousness (or one’s community) is largely governed by lasting feelings of good will, compassion and solidarity for all beings. The process of planetary brotherhood is experienced as a central fact. Lao-tzu, Buddha, Jesus and Krishna, among others, personify this stage of purpose. The practical usefulness of the view of moral stages proposed by Kohlberg is great. Each citizen can examine himself in the perspective of these six degrees of ethics and determine on which level he and his friends live. * What kind of moral worldview do we follow in the situations we face every day? * Which stages of ethical development are dominant in our cities and countries? * What leaders and social groups aim at the proper moral education of children, and at the adequate moral formation of adults? This is not the time to demand perfection from others. There are enough hypocrites doing that already. We should improve ourselves, in the first place – and teach by example. Of course, the structures of collective illusion and ignorance should be shown as such. 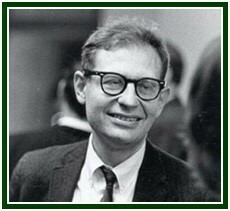 The influence of the books by Lawrence Kohlberg is essentially interdisciplinary. The theosophical and philosophical importance of his writings might be decisive in the 21st century, for they help us clarify the mystery of how to sow good karma. Kohlberg invites us to set the causes of human happiness into motion as best we can, in that which depends on us. Sigmund Freud, in the essay “The Question of Lay Analysis”. See the volume “The Essentials of Psycho-Analysis”, Sigmund Freud, selected with commentaries by Anna Freud, Vintage Books, London, UK, 597 pp., 2005, p. 53. “Essays on Moral Development”, Lawrence Kohlberg, volume I, “The Philosophy of Moral Development”, Harper & Row, Publishers, San Francisco, copyright 1981, 441 pp, see p. 313. * “Essays on Moral Development”, Lawrence Kohlberg, volume I, “The Philosophy of Moral Development”, Harper & Row, Publishers, San Francisco, USA, copyright 1981, 441 pages. * “Essays on Moral Development”, Lawrence Kohlberg, volume II, “The Psychology of Moral Development”, Harper & Row, Publishers, San Francisco, USA, copyright 1984, 729 pages. * “Lawrence Kohlberg, Ética e Educação Moral”, by Ângela Maria Brasil Biaggio, Ed. Moderna, São Paulo, Brazil, 2002, 144 pp. Kohlberg’s six stages of moral perception have an inner relation to the levels of consciousness as taught by classical theosophy. See for instance the articles “The Seven Principles of Consciousness” and “Antahkarana, the Bridge to Sky”. An initial version of the above article was published at “The Aquarian Theosophist”, January 2019, pp. 9-12. “Kohlberg and the Stages of Moral Development” was published as an independent article in our associated websites on 15 February 2019. It can also be seen at our blog in “The Times of Israel”.